Get ready: The peak of the flu season is coming. It’s been a mild season so far, but don’t be surprised if the number of absent employees spikes in the coming weeks. Why? As we’ve noted, cleanliness efforts such as handwashing and cleaning surfaces don’t fully protect facilities against the flu. Instead, experts have proven that the virus is most often spread through the air. Expanding your workplace wellness measures is necessary to fight the organizational harm done by the flu. Though flu season 2016 isn’t in full swing yet, the CDC, in a new epidemic prediction initiative run with independent organizations, has seen an increase in flu cases over the past couple weeks and predict that the number of flu cases will increase significantly throughout the month. Since flu activity usually peaks in February, now is a critical time to heighten your prevention efforts. As of mid-December 2015, only about 39 percent of the U.S. population had received the flu vaccine. Interestingly, the CDC found that this rate was lower (34 percent) among adults 18 to 64 years old. This distinction is important as that age range encompasses the vast majority of working Americans, who often catch the flu from exposure in the workplace or other common areas. 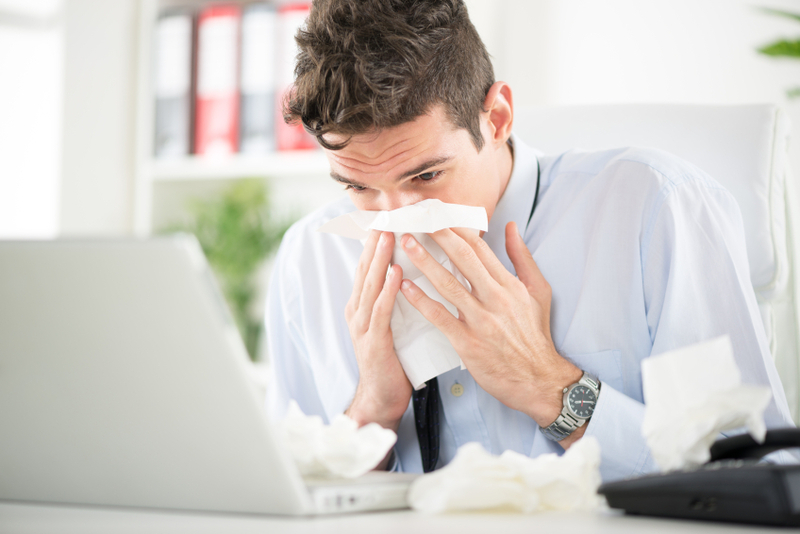 One of the largest challenges office facility managers face is that those carrying the flu virus are most contagious as they begin to show symptoms. That means one employee could potentially contaminate an entire office before even realizing he or she is sick. The CDC accounts about 9 million medical visits every year to catching the flu virus during flu season. That burden drastically affects organizations, as it results in more sick days as well as many ill employees showing up to work and being less productive. Cleaning the air is an imperative component of minimizing the yearly harm caused by the flu. Medical experts agree the airborne virus is the most common means of transmission and that one sneeze or cough puts many contagious flu particles in the air, often for an extended amount of time. Air filtration is an efficient and effective method for removing this harmful virus from common areas. In independent testing, AeraMax Professional air purifier was found to remove 99.9 percent of flu virus from the air in as little as 35 minutes. Download AeraMax Professional’s White Paper to learn more about minimizing the effects of the flu in your facility in 2016.